Amazon has the Minnie Walk & Play Puppy Feature Plush marked down from $39.99 to only $12.29. Mode one: use minnie’ s clicker to teach snowpuff to bark, spin, and dance. 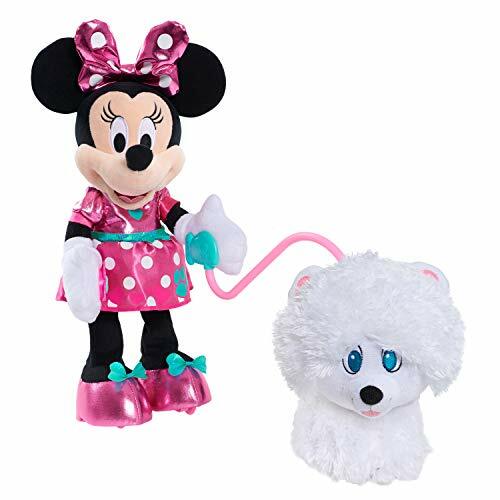 Mode two: attach one end of the leash to Minnie’s hand and the other end to snowpuff’s collar and the pair will go on a real walk! Minnie sings and talks to snowpuff, and snowpuff makes cute doggy sounds! Includes one Minnie Mouse plush, one snowpuff plush, one leash and one training clicker for snowpuff. Snowpuff requires 3 x AA batteries (included).